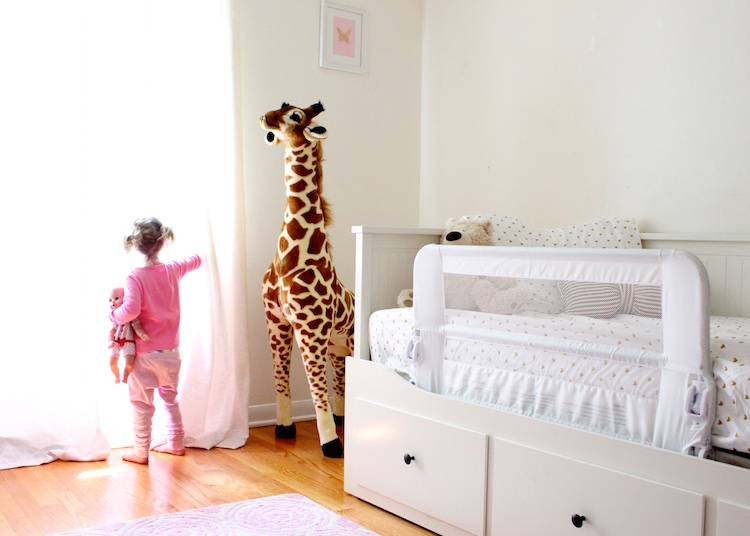 If you know me well, I’ve probably asked you for your advice on how to transition my daughter out of her crib and to a big girl bed. Even if you have had ZERO experience with kids, I probably asked you anyway. I wrecked my brain for weeks going through every possible scenario, researched a gazillion beds and read every article possible, talked to ALL my friends, family, strangers on the street for advice… Okay, I may be exaggerating a little but needless to elaborate, this was a hard decision to make. But, it had to be done! We all have to grow up sometime, right 😉 We felt rushed though so it wasn’t easy for us. Our 2nd child was on the way and we didn’t want to buy another crib. Taylor was going to be 2 years old very soon and we were concerned she was too young to move to a real bed. Thoughts like “am I going to ruin her mental stability for life if I take away her crib too early?” went through my head on a daily basis leading up to the transition. So silly looking back now. We were not only having another baby very soon, but also in the process of moving to another house. After much contemplation, we decided to transition Taylor before we moved so she was familiar with her room and we tried to prevent TOO many changes happening at the same time. I thought I’d share my experience with this transition in hopes that it will ease someone else’s fears! Plus a few of my friends have been asking for the details so here you go……. We considered quite a few options but ruled most out because we were on a budget and ideally wanted a solution that would last more than a couple months. Here are the details on our options in case you are curious! 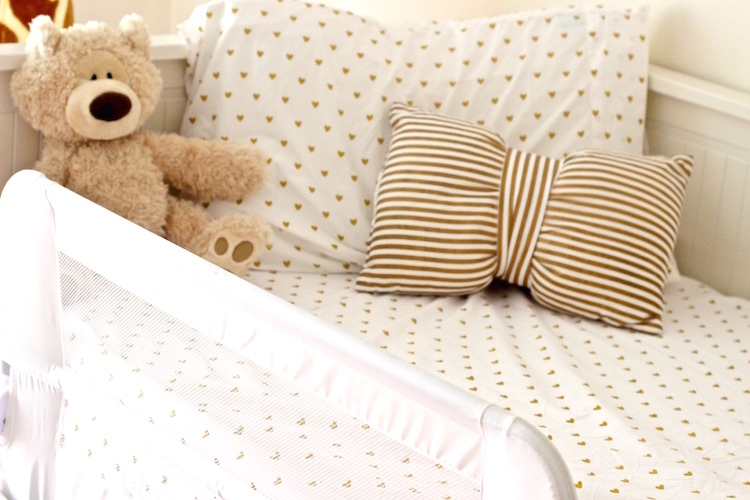 Converter kit for crib from Potterybarn Kids (to go with her crib). This option would cost about $150, which is the price of a decent toddler bed. 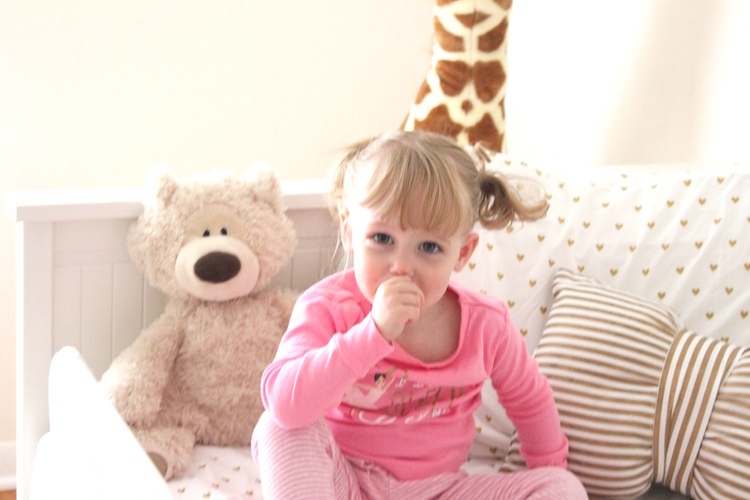 Toddler bed – I found this beautiful toddler bed that I probably would have bought if it wasn’t on backorder at the time. 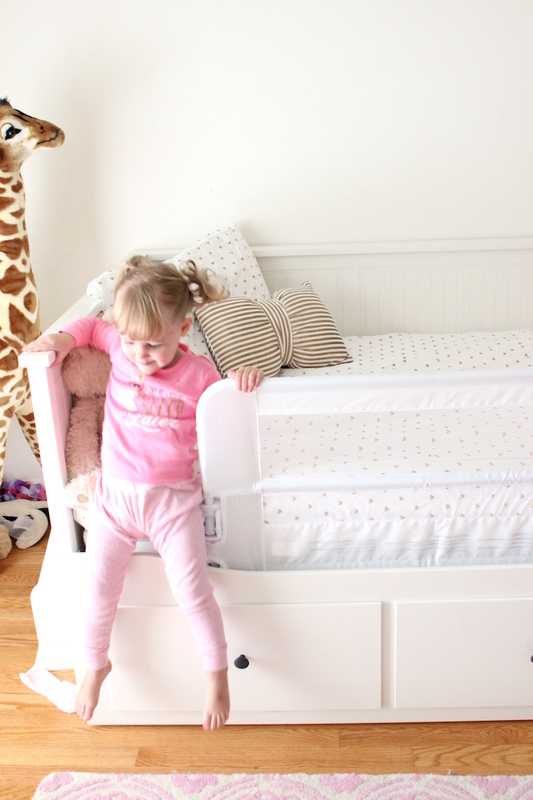 BUT then again, how long do kids really stay in toddler beds? I’ve heard not long at all. Buy another crib. Briefly thought about this but figured Taylor would outgrow it too soon anyway. So how did we go about the BIG transition? We decided to use the daybed we currently owned which worked out really well. It has 3 sides to it so I think this helped her feel more secure like she did in her crib. We bought one extra long guard rail and have been really happy with it. We also bought this waterproof mattress protector from Amazon (just in case). We started with a trip to the BBB to buy some new sheets. Eric and I made sure to emphasize how exciting this was and did our best to communicate the change that was about to happen. Funny enough, Taylor picked out the perfect sheets herself! She is quite the little shopper already. The sheets Taylor picked out had the Disney princess all over them, Sofia the First to be specific. We have changed the sheets since (hence the photos) but glad we have a back up. 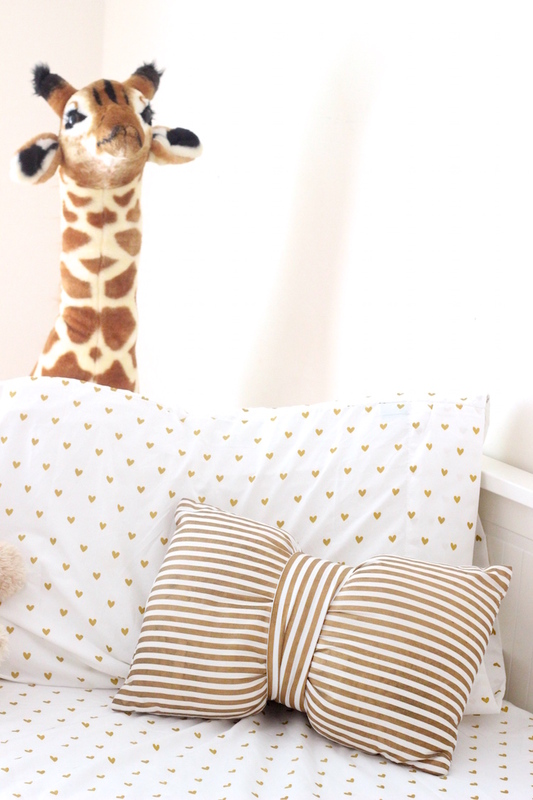 I really think that these sheets and a few fun pillows we added were the key to making this transition! She was SO excited to see her favorite TV show character and couldn’t wait to climb in her new bed. We also added a baby gate to the outside of Taylor’s door so she wouldn’t wake up in the middle of the night and wander the house. I have heard some stories about kids doing this and scaring their parents! We still keep the baby monitor in her room too and will for awhile. This transition was much harder on Eric and me since it really showed our baby was not a baby anymore. We stressed about it so much and yes, we still have some tough nights putting her to bed but overall she has done really well in the new bed. It turns out in the end Taylor was more ready than I thought for her big girl bed. First the bed transition, then what, college?? Eek! It’s been a couple months since Taylor has been in her big girl bed and Kinzie is 3 weeks old now. She has been sleeping in our room so the crib has been unused for awhile now. Hah! 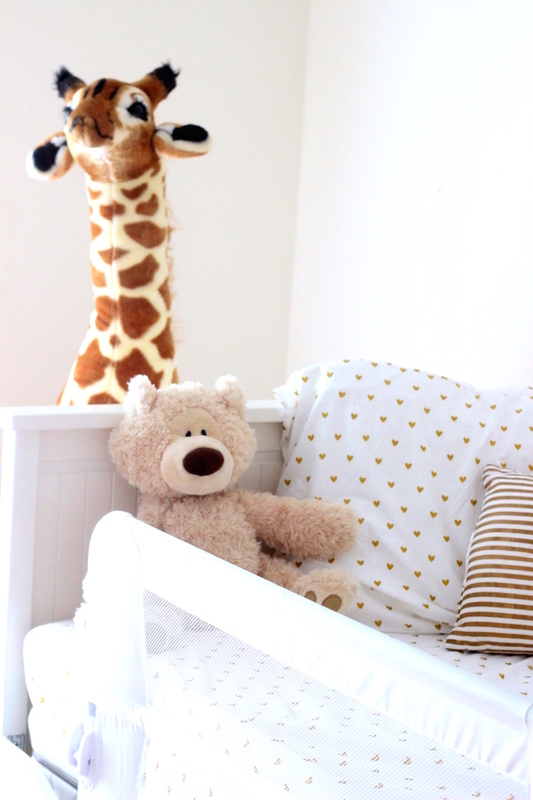 All that worry….. but really, it was probably best to get Taylor used to the bed before having a newborn. Also, according to my abundance of research, it’s best to be careful to make sure the toddler doesn’t get the impression the new baby is taking over her sleeping spot. Hope this post helps someone! I know everyone’s experiences will be different and if you find yourself in a similar situation, I wish you luck!